The genealogy form illustrated below right is known as a pedigree or lineage form. It is one of the most widely used among researchers but it is not designed to hold all the information you have collected about your ancestry. The genealogy form illustrated below is known as a pedigree or lineage form. It is one of the most widely used among researchers but it is not designed to hold all the information you have collected about your ancestry. 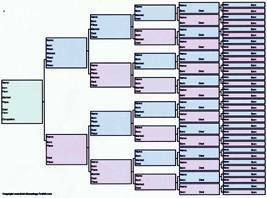 The pedigree chart can hold the basic details of six generations of your ancestors. Click to download. Instead it provides a snapshot view of your direct ancestors going back over several generations. (As you can see from the illustration, the pedigree form covers six generations.) There is no space on this type of form for siblings or multiple marriages. The pedigree chart follows a standard, easy-to-read format which is recognised the world over - even by most family tree software programs. Each chart begins with you, or the relative whose ancestry you are tracing, on the left. Information on the paternal line is entered on the upper half of the page. That for the maternal line is entered on the lower half. These free forms can be downloaded below. You have a choice of download. Select according to how you want to use the pedigree form. Print the form and fill in your ancestors' details by hand. Fill in the form on screen, save and print. You don't have to fill in all 63 names at one sitting! You can fill in what you know today, save the form to your computer and return to it when you want to fill in another tranche of your research. When finished, you can print it out. 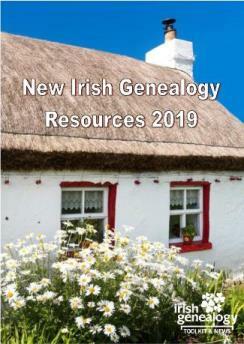 See the full range of free family history forms. When completed, the pedigree form looks really impressive framed and hung on the wall. If you haven't yet discovered all six generations, you might prefer to create and frame a 3- or 4-generation family tree. Choose a family tree template from my exclusive range.